Asia-Pacific buyers are far ahead of their Western counterparts in as-a-service model adoption. It’s no secret that companies are changing the way they buy and receive services to support their business operations. After all, traditional “lift-and-shift” approaches lost their luster years ago. Today’s executives aren’t simply looking only for the most cost-effective way to get the technology they need, when they need it; they also want measurable business outcomes. What savvy leaders already know is that when it comes to this “As-a-Service” approach, they don’t need to settle for just on-demand software or infrastructure—they can get everything. It’s an entirely new service economy, with vast potential for transformative outcomes. So why has one region in the world, Asia-Pacific, been leading the charge to embrace the As-a-Service model? 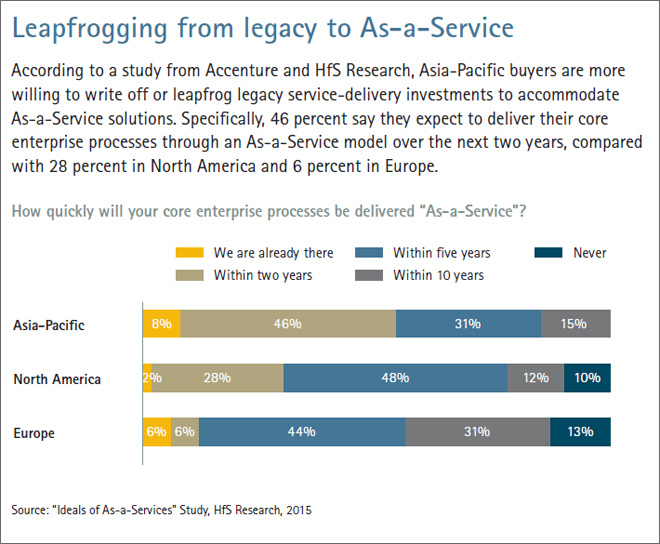 A new study by Accenture and HfS Research—in which 716 enterprise service buyers, advisors and provider executives worldwide were surveyed regarding the As-a-Service phenomenon—reveals that many Asia-Pacific companies are leaving their Western competitors behind when it comes to leveraging As-a-Service. Why they’re using the consumption model is clear: There are distinct advantages that come with As-a-Service. Combining innovative digital technologies that include cloud, cognitive computing, big data analytics, automation and robotics, the As-a-Service approach provides companies with “plug-and-play” business services that give them the agility to scale up or down on demand; the flexibility to pay for what they use, when they use it; and the ability to get results—fast. As-a-Service offerings have grown from standalone cloud-based software apps to platforms that cover entire business processes, enabling companies to boost productivity significantly while paring operating costs and driving measurable business outcomes. And yet, despite the benefits the As-a-Service model brings, regions beyond Asia-Pacific have not been as quick to follow suit. 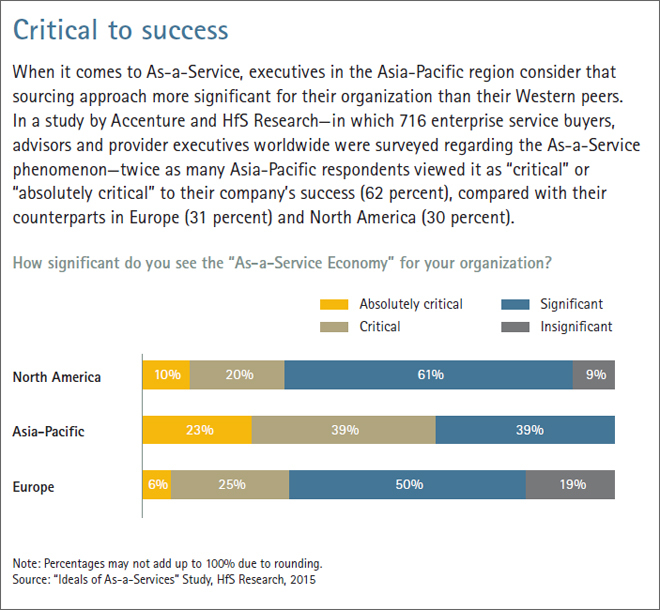 Our research reveals that companies in Europe and North America remain intrigued but hesitant about the As-a-Service approach, while those in the Asia-Pacific region express a greater willingness to explore and experiment in this area (see chart below). A broad majority of Asia-Pacific buyers (62 percent) view As-a-Service as “critical” or “absolutely critical” to their company’s success—twice that of North America (30 percent) and Europe (31 percent). Our research suggests that this geographical gap could ultimately compromise the efforts of Western companies to deliver value with the same agility and cost-effectiveness as their peers in the Asia-Pacific region. It’s not just a matter of viewing As-a-Service as critical. To lead in this area, businesses have to invest in the technology that enables them to fully leverage the model. And companies in Asia-Pacific are doing exactly that. Consider Asia-Pacific buyers in emerging markets. According to our research, these buyers are leading their global peers in making As-a-Service investments that focus on the cloud, automation, business redesign and operations talent. And they are among the most willing to write off legacy service-delivery investments to accommodate As-a-Service solutions. For example, 31 percent of Asia-Pacific respondents say they expect to make significant progress in this area over the next two years, compared with 15 percent of respondents in North America and 6 percent in Europe (see chart below). Of course, not many companies in Asia-Pacific emerging markets have the same legacy burdens as established companies in developed markets, such as Japan and Australia. But what the Asia-Pacific companies in our survey share—whether from developed or emerging markets—is a sourcing mindset. Emerging economy companies in the region are willing to embrace a model that provides cost savings and enables agility and innovation, while developed economy companies are second- and third-generation business service users, already comfortable with the benefits that sourcing can bring. This mindset may be why Asia-Pacific is so far ahead when it comes to leveraging As-a-Service. Whether due to the high levels of entrepreneurship that enable companies to adapt quickly to the region’s dynamic business environment, or to low-wage nations such as China and India seeking new sources of value beyond wage arbitrage as they expand both regionally and internationally, leaders in Asia-Pacific are the most optimistic about the new world of As-a-Service. For an example of As-a-Service in action, consider a major Resources company. The company is migrating its core enterprise information systems and technology systems to a cloud-based As-a-Service solution that incorporates consumption-based pricing. The move is expected to drive significant cost savings and increased business agility while fully supporting the company's business priorities. Embracing the As-a-Service approach can enable companies to nurture innovation and renew the abilities of their support functions to move at the pace of an industry like mining, which can experience high levels of variability. Executives who want to move toward As-a-Service should consider four key principles. Flexibility. As-a-Service flexibility means having complete volume variability with no minimum volume commitments. More important, it uses consumption-based pricing instead of traditional transaction-priced approaches. Future protection. Providers continuously refresh their As-a-Service offerings to keep buyers up to date in the least disruptive way possible. Many companies view this practice as a fundamental element of the As-a-Service model. Ecosystem leadership. The As-a-Service approach spans multiple providers that, taken together, offer the buyer a specific combination of solutions. Companies often put an ecosystem leader in place to help ensure that all the moving pieces of the different partnerships are working together to provide the desired performance outcomes. Innovation. In addition to seeking future protection, organizations focused on implementing the As-a-Service model often express interest in attaining innovations in their Industrial Internet of Things (IIoT) networks, analytics capabilities and connected platforms. They also recognize that achieving these innovations will necessarily change the way the IT organization supports the business side of the company. Consequently, the ability to innovate becomes one of an organization’s most sought-after business outcomes. To reap the benefits of As-a-Service, service buyers in all parts of the world need to think like entrepreneurs, view all parts of their business and processes through an As-a-Service lens, and identify where and how to begin the transformation of their legacy models. Leaders should also consider the following. Engineer a mindset change. Executives that have gone the As-a-Service route often say the biggest issue involves letting go of “legacy thinking.” One significant mindset shift involves the need to recognize that companies do not have to “own it all.” This shift tends to be more challenging for business processes in which the company invests a lot of money, such as IT; success typically requires a leader who has experience with service delivery. Consider beginning the As-a-Service transformation with processes requiring fewer investments, such as procurement. Then, as budgetary concerns arise, services may be switched on or off. Define the outcome you seek. As-a-Service is an enabler, not an outcome. It can help companies become more agile and innovative, but the fundamental outcome the organization is trying to achieve lies beyond the service it is buying. In the old sourcing world, companies spent a lot of time defining what it was they were buying. In the As-a-Service environment, it makes more sense to focus on how services will drive specific business results. Rethink your partnerships. To fully leverage the As-a-Service approach, build strategic partnerships that are more inherently focused on value and innovation than on a more traditional supplier management model. Pursue talent. Transitioning to an As-a-Service model requires more than partnering with trusted service providers. This new environment also requires different talent within the company itself. Whether it’s a progressive CIO or an aggressively entrepreneurial CEO, new talent can often inspire an organization to pursue the benefits that As-a-Service promises. It’s an exciting time for sourcing. The As-a-Service approach can transform business services; enable more intelligent, agile and robust business operations; and drive innovation that disrupts existing business processes and supports entirely new business models. It’s a long way from traditional lift-and-shift sourcing—and that shift may seem daunting. But one region is already embracing the model, moving boldly into the new world of As-a-Service. Those Asia-Pacific businesses share the same entrepreneurial spirit that animates game-changers such as Uber in personal transportation and Airbnb in the hospitality market. The payoff from making this service-delivery transformation is potentially huge. It’s not too late for their Western counterparts to begin exploring the As-a-Service approach—and reap the rewards that will come. leads Accenture Operations in the Asia-Pacific region. He is based in Singapore.